Don't worry. The link is not phishing. The Ganges River is a sacred river in India which is believed to be the terrestrial home of the god Ganga. It is believed by the Hindus that if you bathe in the water, your sins will be washed away. The Ganges is estimated to be around 1557 miles long, listed as the 34th longest river in the world. According to Gaytha A. Langlois, Ph.D. at Bryant University, the Ganges River Valley is around 200 to 400 miles long. The average depth is 52 feet, although it can range up to around 100 feet. Although this river is very important, it was listed by CNN-IBN as one of the ten most endangered river and one of the five most polluted river. A cause may be because many people, like the one pictured on the left, bathe in it each day. 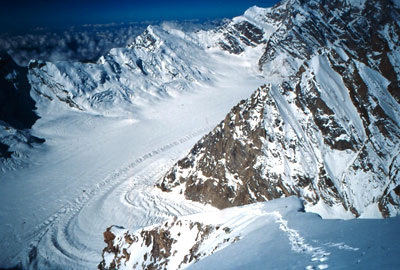 The origin is a glacier on the Himalayan Mountain Range. The glacier is called Gangotri. Varanasi is the holiest city in India and is near the Ganges river. It is believed that if you die there, you will be free of your sins. The Sunderbans, the largest delta in the world, is along the banks of the Ganges, according to Buzzle. The animal on the top of the Ganges River food chain is the Ganges River dolphin, unique to this area. Another importance use of the Ganges River is use as water for irrigation. You may also wonder what is on the woman in the picture above's head. It is called a bindi. It is a decorative mark between the eyebrows. They are usually worn by Hindu women. According to VaranasiCity.com, there are two important dams in the Ganges River, called Haridwar and Farakka. The Ganges has many tributaries, including the Yamuna River, Son River, Mahananda River, Kosi River, Gandak River, Ghaghara River, and last but not least, Mahakali River. This is the Gangotri Glacier, which is one of the main sources of the Ganges. This is the Ganges River, in the city of Varanasi, the holiest city in India. 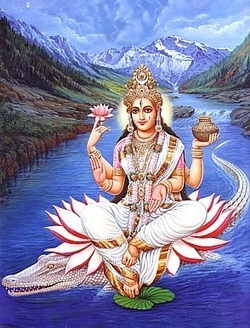 This is a picture of the Goddess Ganga, which is believed to have a terrestrial home on the Ganges River. She is known as a forgiving Goddess. This is the Ganges River Dolphin, unique to the Ganges River. According to IUCN, this animal is classified as "endangered". Its nickname is the Blind Dolphin. The scientific name is platanista gangetica. 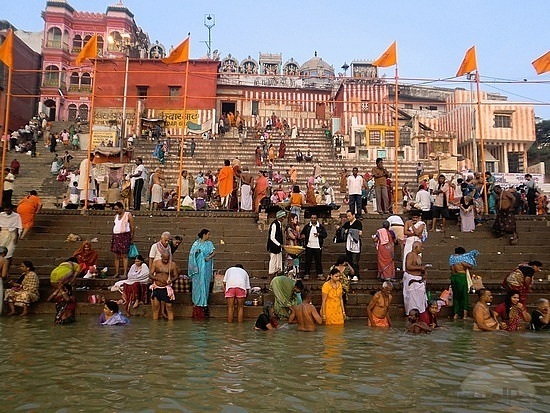 People are bathing in these holy waters of the Ganges. They believe that if they die in the Ganges or bathe in it, their sins will be washed away and it will increase their karma. "Table%2079-35.pdf." Caotlavc.com. N.p., n.d. Web. 3 May 2012. <www.caotlavc.com/pdf/2B/Table%2079-35.pdf>. kalpana. "Ganga is dying, pollution the killer." GREENDIARY. GREENDIARY, n.d. Web. 3 May 2012. <www.greendiary.com/entry/ganga-is-dying-at-kanpur/>. "The Ganges River, Indus River and oceans surrounding India are vital.."India In Your Home: Discover Indian Culture, History, Geography and more.. N.p., n.d. Web. 3 May 2012. <http://www.india-in-your-home.com/ganges.html>. Alphonse, Marlene. "Ganges River Facts." Buzzle. N.p., n.d. Web. 3 May 2012. 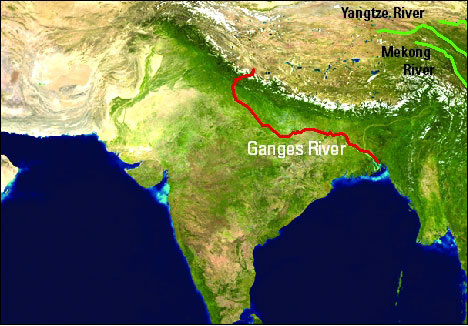 <http://www.buzzle.com/articles/ganges-river-facts.html>. "The Ganges River | The Story of India - Photo Gallery | PBS." PBS: Public Broadcasting Service. N.p., n.d. Web. 3 May 2012. 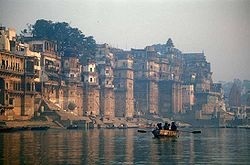 <http://www.pbs.org/thestoryofindia/gallery/photos/4.html>"Interesting Facts on Ganga - Facts on River Ganga - Facts About Ganges - Ganga Facts." Varanasi Tourism - Travel to Varanasi - Varanasi India - Varanasi City - Varanasi Travel Guide. N.p., n.d. Web. 3 May 2012. <http://www.varanasicity.com/river-ganga/interesting-facts.html>.
" The religious belief is gradually pale the Indian Saint river pollution to be even more serious - NMGBMZBWG . "NMGBMZBWG - NMGBMZBWG . N.p., n.d. Web. 3 May 2012. <http://www.nmgmzbwg.com.cn/archives/4555>. "Gangotri Region, Garhwal Himalaya. "Free Encyclopedia & Web Portal on Indian Culture & Lifestyle. N.p., n.d. Web. 3 May 2012. <http://www.indianetzone.com/44/gangotri_region.htm>. "Ganges - Wikipedia, the free encyclopedia." Wikipedia, the free encyclopedia. N.p., n.d. Web. 3 May 2012. <http://en.wikipedia.org/wiki/Ganges>. "Route of Ganges river." All about India. N.p., n.d. Web. 3 May 2012. <http://www.all-about-india.com/Route-of-Ganges-River.html>.
" Goddess Ganga | River Ganges | holy Ganges River | Legend of Birth of Ganga ." Festivals of India | Indian Festivals 2012 | Fairs and Festivals in India | Festivals in India. N.p., n.d. Web. 3 May 2012. <http://www.festivalsofindia.in/Deites/HinduGoddesses/Goddess-Ganga.aspx>. "A BLIND DOLPHIN IN ONE OF THE WORLD'S MOST DENSELY POPULATED AREA." WWF. N.p., n.d. Web. 3 May 2012. <www.worldwildlife.org/species/finder/gangesriverdolphin/gangesriverdolphin.html>. The, however, and may use the name of the younger.. "Hindu Way of Life." Welcome to Mailerindia.com, The Best informative Web Portal !. N.p., n.d. Web. 3 May 2012. <http://www.mailerindia.com/hindu/veda/index.php?hculture>. Cited by BibMe.Org"BibMe: Fast & Easy Bibliography Maker - MLA, APA, Chicago, Turabian - Free." BibMe: Fast & Easy Bibliography Maker - MLA, APA, Chicago, Turabian - Free. N.p., n.d. Web. 3 May 2012. <http://bibme.org>. Hinduism: Hinduism connects to Ganges because the people that live in or near the Ganges River are mainly Hindu people. Some quick facts about Hinduism are... This religion, one of the oldest known, dates back to 2000 B.C. Hinduism is a polytheistic religion, meaning they believe in more than one god, although they believe that the one God is going into different forms. They also have their own language called Sanskrit, which also is an old language. As mentioned in Traveler's Tips, you should never wear your shoes into a Hindu person's home. If you are attending someone's wedding ceremony, expect some people to sprinkle red powder on your hair as a blessing.